outerlayer as well, look no further. I got to use this jacket last season and it is great. The days of wearing simple fleece insulating layers are over for me! The Polartec “Alpha” fabric in this jacket does an awesome job of breathing, retain it’s warmth when wet, blocking the wind and looking good around town too! 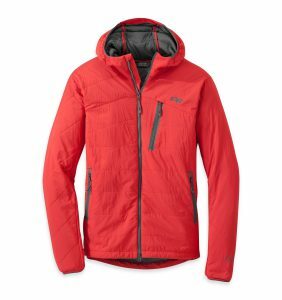 This jacket is right at home using ski touring or ice climbing. How is the fit of this jacket? I’ve read the the Superlayer was tight under the sleeves and was wondering if the Uberlayer is similar. The Superlayer never worked well for me. I didn’t like the fabric very much and yes, the fit was a little snug. The Uberlayer, for me, is a 100% improvement. It fits better, preforms better, feels and looks a lot better. If you decide to get one send me a message and let me know how you like it.